At our base this morning, Central Beacons MRT publicly unveiled and officially launched our brand new, multi functional and revolutionary 4×4 Ford Ranger response vehicle. Brendan Toomey leader of Merthyr Tydfil County Borough Council made the opening speech paying tribute to our work within the community. Also in attendance was Alison Reddy of Ffos Y Fran Community Fund and Supt Jim Dyson of South Wales Police, all key contributors to our fundraising project to purchase Echo. Mark Moran, team Chairman and project lead said, “We’re delighted that rep’s from Merthyr Tydfil Borough Council and from the Fros Y Fran Community Fund Project are able to join us this morning, without their support the vehicle purchase would not have been possible”. The project team, made up of team members, took on the challenge of creating an innovative, simple and reliable solution for the vehicle. The first challenge was vehicle selection and, having always used Land Rovers, moving away from them was a big decision before finally choosing the Ford Ranger. After extensive reviews and evaluations, we chose Bence of Bristol to fit out the vehicle with the radios, emergency lighting, sirens and bespoke equipment storage that we require to suit our operational needs. Bence had a fine record of delivering solutions and showed a real desire to work with us to deliver a ground breaking design at a very affordable cost. 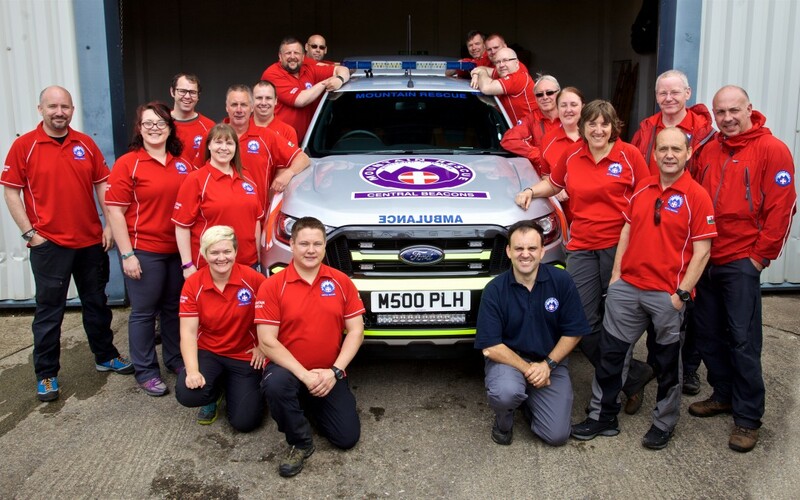 We also want to take this opportunity to say THANK YOU to all of the members of the public who made generous donations towards this project, after losing our previous response vehicle in an incident in 2015, the response from the public with kind words of support and generous donations is overwhelming. Being a voluntary charity, our fund raising has to continue of course and to take our service levels higher our sights are now set on the long fundraising road to replace our control vehicle which is used as a Mobile Command Centre for orchestrating rescues across the Brecon Beacons, Mid, West and South Wales.